A Judo Spectator's Guide - Just in Time for the Olympics! So you've come across the Judo footage, but you're having a hard time following what's happening? This is the place for you. There are a ton of rules and nuances (largely inane) in Judo, so think of this as a high-level guide. If you see something that doesn't fit with this guide, it probably has to do with one of those nuances. I'm not a rules expert, but if you have a question, feel free to leave a comment and I will answer as best I can. Waza Ari: Get 2 of these, and you win - the ref will hold his arm straight out to the side. You get a Waza Ari when the throw isn't quite as good, the pin is at least 20 seconds, or the opponent accumulates just 3 penalties. Yuko: Think of this as a tie-breaker point; no number of Yukos is as good as a single Waza Ari - the ref will hold his arm at a downward angle to the side. The throws will typically land the opponent on their side instead of their back, the hold-downs are between 15-20 seconds, and only 2 penalties are needed for a Yuko. What exactly is "Golden Score"? "Golden Score" is basically overtime for Judo. If there is no winner at the end of regulation time (5 minutes for men, 4 for women), then it goes into a 3 minute sudden death, where any score for any reason wins. Soooo... what's with the penalties? - or, What's with those yellow squares? There are way too many things that get you penalized in Judo. I won't go over them here, but the most common two that you will see are going too long without attacking (the ref rolls his arms like a "travelling" gesture in basketball), or for making garbage attacks that are generally aimed at killing time or trying to get to the ground (the ref makes a downward tugging motion with his arms). Whatever the penalty, the ref will stop the action, make some gesture (like one of the two mentioned above) at one of the contestants, and then point at that contestant. When one contestant is penalized, the first one will be a warning (unless it's a severe penalty, in which case she'll just get thrown out), and you'll see a yellow box show up next to their name on-screen in NBC's coverage (actually, it'll be next to a white or blue box, which just denotes what color gi the contestant is wearing). The second penalty (two yellow boxes) awards a Yuko. Things get a little weird at the third penalty: the Yuko is removed, and a Waza Ari is added to the opponent's score, and three yellow boxes are shown. And if the opponent already had a Waza Ari, then the match is over (2 Waza Aris = win). The fourth penalty removes the Waza Ari, and the contestant is disqualified. How do you medal? - or, What's with the two bronze medals? - or, What the heck is "Repechage"? Repechage is the French word for loser's bracket. Not really, but you can think of it that way. Basically, what happens is this: repechage begins with two matches consisting of the four losers from the quarterfinal round. The winners of each match will go on play a loser from one of the two semifinal matches. The two winners of these matches, then, are awarded a bronze medal and their day is done. The winners of the semifinals compete in the finals (of course): the winner gets gold and loser gets silver. Wow... the 60 kg Frenchman Milous was really given a gift against his Georgian opponent: Down a yuko with 30 seconds left, he was thrown for no score with only his Frenchness preventing the Ippon (the Georgian was ROBBED). With JUST 5 SECONDS on the board, Milous destroyed the guy with an ippon. Sigauque (right) from Mozambique is 27, though this dude looks like a teenager. Watching this stuff without Neil Adams doing the commentary just isn't the same... I just want someone to yell "ROIGHT THE WAY OVA!" or "HE SWITCHED IT!" Also, the randomly-timed advertisements on NBC.com's streaming are ANNOYING. Couldn't they find an intern somewhere to put in queues for commercials during the "Matte" times, or - better still - after matches?!? Also annoying is the fact that it crashed my computer several times. Is it just me, or are there a TON of "golden score" rounds due to nobody scoring in the regular contest time? I have watched a number of contests where the only score was due to a second penalty in overtime. BOOOORIIIIING. Glad to see that all of the rule changes have made the contest so spectator-friendly and encourage such great judo! The best example of bad reffing was in the 66 kg mens bracket: Ebinuma of Japan (white) vs. Jun-Ho of S. Korea (blue). It went into sudden death, and blue was making the best effort by far until white busted blue, and was awarded a Yuko. The replay confirmed that it was a good call - but the match kept going. In sudden death. Even though white had scored. Now... to be honest, I was keeping one eye on my kids, so I am sure that I missed the part where he waived off the score, but it was very disjointed. Anyhoo, skipping ahead to the end, time runs out, and it goes to ref decision. All three judges raise their flags for blue (S. Korea) - and then the Japanese coach goes nuts, everyone stands there for a few minutes, and then the refs pretend like nothing had happened, and raise their flags for white. Huh? I found this article that explained that it was "overturned by a reviewing commission." Huh? Terrible. The Olympics are here, and that means it's JUDO TIME! Good news: nbc.com is covering all Judo events! Bad news: the live coverage begins at around 4:30 AM, Eastern! Good news: many cable subscribers will be able to watch replays online at any time! Bad news: MY CABLE SUBSCRIPTION DOESN'T LET ME WATCH!! F&@*$(! Good news: Evidently, NBC will let you watch it 48 hours after the event if you don't have the right cable subscription! It will ask you to log in to your cable provider's online service. Do that (and if you don't have a login, set one up). It will then tell you if you are eligible to watch... unfortunately for me, I'm not! So... I'm not advocating that anyone who isn't eligible should hit up their friends for *their* cable provider login info, because that would be immoral. If you *are* eligible, starting on Saturday, July 28, you can go here for the Judo events. You can certainly watch them live if you want, but I'll be watching later. That's it! There are probably other ways to watch, as well - for instance, there is an NBC iPad app out there that you can use (though I suspect you still need the right cable subscription). If you know of alternatives, please leave a comment (I may need the help!). Also, the NBC site has several decent articles covering Olympic Judo. Just head to this page. And thanks to Ward for the video link. Hajime to Matte Model: Throw! Well... not much to say about this one. You've moved, you've gripped, and you've moved them again to create the opportunity for the throw. So... throw them! Keep Your Hands in Front: The closer your hands are to being straight in front of you, the stronger they are, and you lose a lot of power if they get behind your shoulder. Enter Your Throw Low: For most throws, particularly forward throws, you want to bend your knees before entering. Shoulders Forward: Keep your shoulders slightly in front of your hips almost all the time... this will keep you from being thrown backwards. Balls of Your Feet: Stay on the balls of your feet for better mobility. If you get caught on your heels, you can be thrown backwards easily. Tsugi Ashi: Use the following foot walking and avoid wide stances. You'll be more nimble and less likely to get swept. Get the "Tempo": This actually has more to do with "Move before you throw"... You can move in such a way that you actually get a "free move" to throw your opponent. Foot Angles: Uke's feet determine the direction(s) in which they are most easily off-balanced. The Glue: When throwing, don't let Uke's body slide against yours - stick him to you so that when you move, he moves, too! Jimmy Pedro drills well. Jimmy Pedro won the World Championships. Most people don't drill well. Most people haven't won world championships. He identified common failure points, he instructed the Uke on specific ways to take advantage of those failures, and told Uke to try catch Tori at those points during the drill. This is huge...Rather than just saying "add resistance", he gave specific instructions on when and how to resist. If you have been doing Judo for at least a week, you have probably run into a guy who, when he hears "now add some resistance" or "go 50%" seems to understand that it is now his job to "win" the drill (*cough*Jesse*cough*). While this doesn't cure that, it certainly helps localize the infection, so to speak, and gives Tori a much more manageable situation. It also helps Uke recognize the flaws in the technique, and gives him or her the the tools to exploit them. Inadequate clamp on the leg. Uke was to bring that leg into play in trapping Tori's leg if able. Grabbing for the head before moving up the body. Uke was to apply Ude Gatame if Tori allowed it. I knew at the time that I really liked how Jimmy taught his drills, but it wasn't until this week (several years later) that I realized why I like it so much... Having now given it some thought, though, though, I'm definitely going to use this approach to adding resistance in my drills more often. Jimmy's dad, Jimmy Pedro, Sr., is a big part of the reason for Jimmy, Jr.'s success, and he likely informed the way that Jimmy, Jr. drills. This is one of the reasons I'm excited about the book that he and former world champ Dr. Ann Maria de Mars have recently completed, to be called "Winning on the Ground." My guess is that it will have a bunch of drills like this - TBD if they will focus on the failure points and how to exploit them, but I'm keeping my fingers crossed. 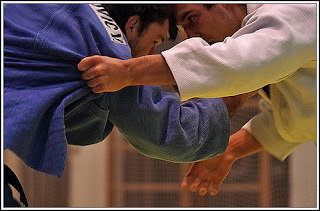 Note: While I was looking for an image for this post, I came across a more detailed walkthrough on the Judo Info site. Labels: Drills, Greatest Judo Training Camp on Earth, Guard Pass, Jimmy Pedro Jr.
Hajime to Matte Model: Another Quick Thought on 'Move Before You Grip"
There's a benefit to just keeping yourself moving. For the background on this post, see this. You've probably heard the expression "Stay on your toes." It basically means you need to be ready to react to the unexpected. And how about "He was caught flat-footed"? That one suggests, basically, that something bad happened because someone wasn't ready to react - because they weren't "on their toes," in other words. Watch a pro tennis player waiting for a serve. They don't just stand there - they bounce around or at least look like they have happy feet. Watch the soccer goalie while he's waiting for the penalty kick. Same thing. Go to a football practice, and listen to the coach when his running back runs in to a pile of bad guys - "KEEP YOUR FEET MOVING!" The RB will be better able to keep his feet under him and able to respond if he keeps those bad boys moving. And while you're there, watch a linebacker before the snap. Moving those feet. All that said, in Judo, you don't want to place too much importance on this - though it is worth a thought. We also have to be alert that we don't move stupidly. We can't be remaking a scene from Flashdance while we attempt to grab our opponent.Skip to 1:57 to see what I'm talking about. Or watch the whole thing and just take in the majesty. In Randori and Shiai, people often either overlook Kuzushi, or simply can't create it. "Move before you throw" can help. I've been writing about Nick Lowe's Hajime to Matte model. Thus far, we've moved before the grip, and we've gripped. Pretty simple. Now it's time to move before we throw. "Move before you throw" is not about simply moving yourself as you turn in for a throw (Tsukuri), it is aimed primarily at moving uke to create Kuzushi. Too often, people want to jump right into their throw as soon as they get a good grip, when often, that good grip isn't enough. You set in, and your opponent is then able to off-balance you because he was stable and ready. Has that ever happened to you? It's happened to me. A lot. As I thought about this model, I think this is one of my biggest weaknesses in Randori. But the good news is that I think I know how to fix it. You have to get your opponent set up to be thrown. Broken balance, compromised posture, uncontrolled movement... these are the sorts of things you usually need to achieve in your opponent to throw her. We all know this, of course. The problem is that it's a helluvalot harder to get that off-balance when the bad guy doesn't willingly stand on her tippytoes for us. Our arms often aren't strong enough to get those simple off-balances. Well, if our arms aren't strong enough... maybe we can use the rest of our body. Quick physics reminder: Force = mass * acceleration. When you use your arms as a tether for your body weight, you are now able to apply a lot more force to your opponent, because of the additional mass that is coming in to play. And the other part of the equation - acceleration? That's where you have to *move* that body. So now that you are moving that mass of your body, you are applying a much greater force to your opponent - and that great force tends to be much more disruptive than just using your arms would be. Once you achieve that disruption, however, you can use your arms (which you can move much more quickly than your entire body) to capitalize - reinforcing the initial disruption, exaggerating their recovery, etc... And, boom! Kuzushi! Your opponent comes along, you must grip it. Before the ref can count too long, you must grip it. -- I can do this all day. And I hope at least some of my readers have heard of Devo. Continuing my series on the Hajime to Matte model from Sensei Nick Lowe. To read the other stuff I've written about this, click this. The short version is that when you hear "Hajime," a cycle starts - a series of phases is kicked off, and you want to "win" every phase. In this post, we're talking about the "Grip" phase, so let's give some thought to how to win this gripping phase. Armed with this understanding of what you are going for, how do you now go about obtaining this dominating grip? World-class athletes swear that you should never reach with your Tsurite (your power hand) first. Always make first contact using your pulling hand (Hikite). World-class athletes (different ones) swear that you should usually reach with your Tsurite first. Ergo, I don't think it matters which one you reach with first; really, variation in your approach to gripping is the key. You have to mix up which hand you are using, what your targets are, what angles you are taking, etc., all in relentless pursuit of your grip. Get them to react: hand feints and messing with their feet are good tools for this. Speed helps, and it's not just a matter of getting your hands there quickly - you also have to be able to secure that grip quickly. Loosen their gi for them (e.g., swat their lapel open) if that fits into your plans. Use anything you can get hold of as a handle, and use that handle to move your opponent (or at least parts of your opponent) to improve your grip. Use throw attempts to set up bettter grips. All of this is easier said than done, so you need to drill your gripping situations. There are a million good drills you can use. And don't wait for "the dominating grip" to throw your opponent... throw them as soon as you see an opportunity. And one tip - there's no such thing as a dominating grip for the little guy when there is a gross mismatch in size and strength - you may want to really pay attention to not letting them get their grip, and launching your attacks as you are able. If you've ever looked for Judo books, you've probably seen the "Judo Masterclass Techniques" series by Ippon Books (the same folks who do all of the "Fighting Films" Judo videos). These books are small (a bit bigger than a folded sheet of paper) and reasonably thin (generally right at 100 pages), so they generally come out looking like very large pamphlets. They're also very expensive. For us in the US, we have to pay $20-$25 per pamphlet book. Now, if a book serves as a great reference and the 100 pages are chock-full of good information, I think that's $25 well-spent... These books, though... I always feel like I got ripped off. When I think of a "Masterclass," I think of something geared towards those who already have a good command of the basics. The Masterclass books invariably spend a lot of real estate on the basics, so you end up getting prescious little "master" material. And this would be fine if it were a $7 book. But it isn't. I was thinking about this as I was reading Steve Scott's newest book, The Juji Gatame Encyclopedia. It's 400+ pages all on what boils down to a single technique. I'll be reviewing it when I'm done reading, but I hadn't gotten too far into it when I thought a great line for this book would be, "Like a Masterclass book, but not a ripoff!" (Mr. Scott: You can use that slogan for free!). 400+ pages, a bajillion detailed variations, defenses, problem areas... I'm loving it so far. This is what the Masterclass books should be. You've moved forward. You've gone ahead. NOW GRIP IT! GRIP IT GOOD! I've been expounding on the Hajime to Matte model that Sensei Nick Lowe teaches (see here for the overview). We've covered "move before you grip"), so the logical next step? GRIP! So before I get in to this, let me first give the disclaimer that I am probably the least qualified person to write about gripping. Well, that's probably over-doing it... my 2 year old's Kumi Kata is terrible, *and* he doesn't know how to write. But after him - me. Before we get to the meat of the subject, I'd like to quickly cover the components of a grip. In most situations, you will lay two hands on your opponent. Lucky us! There are Japanese names for these hands! Right-sided Tsurikomi Goshi: You turn to your left. Your Hikite is your left hand (sleeve grip), your Tsurite is your right hand (lapel grip), as usual. Left-sided Sode Tsurikomi Goshi: You turn to your right (opposite of what is pictured). This time, your "pulling hand" is the right hand on your opponent's lapel, and the sleeve hand becomes the Tsurite! Tune in next time for more ramblings on gripping!